I recently spent a couple of days in Atlantic City, N.J., and it wasn’t too long before I needed a drink. At Carmine’s, a New York-based chain of family-style Italian restaurants (this one in the Tropicana Hotel and Casino), I spied a bourbon-based cocktail on the menu. The Very Italian Old Fashioned is made with Maker’s Mark, Punt e Mes Sweet Vermouth and bitters. The vermouth adds the Italian accent. 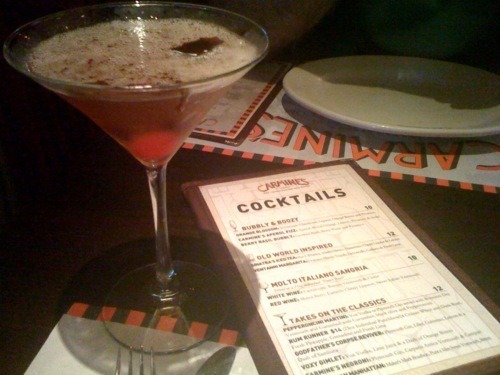 Produced by the Carpano distillery in Turin, Italy, Punt e Mes is reddish-brown, very dry and bitter – so bitter that even Maker’s Mark, one of the sweetest bourbons, was overpowered. I think I’ll stick to the old-fashioned Old Fashioned. In Philadelphia later in the week, I was surprised by the number of bourbons – 16! – offered at Triumph Brewing Co., which is, after all, primarily concerned with the production of beer, along with menu items featuring local and organic ingredients. I can attest that the Brunch Stout, brewed with milk, sugar, cocoa nibs, English barley and locally roasted coffee, will wake up your tastebuds. Yum.